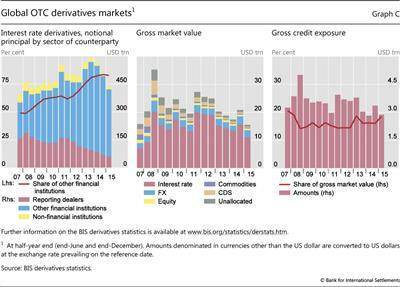 Outstanding positions in global over-the-counter (OTC) derivatives markets shrank significantly in the first half of 2015. Notional amounts of outstanding contracts fell by 12% between end-December 2014 and end-June 2015, from $629 trillion to $553 trillion (Graph B, left-hand panel). Changes in outstanding notionals, however, do not necessarily reflect changes in market activity or in the risk that is actually held. Dealers often enter into derivatives contracts to offset existing exposures. The move towards central clearing tends to further inflate outstanding notionals; after novation to the central counterparty (CCP), a single trade between two dealers becomes two outstanding contracts of each dealer with the CCP. 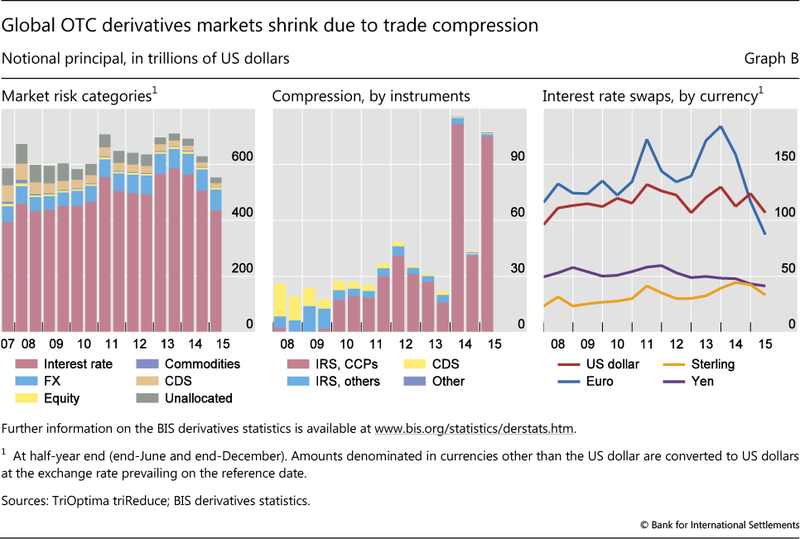 Trade compression - a process of tearing up trades to eliminate economically redundant derivatives positions - has reversed this trend, helping to sharply undercut the value of outstanding notional OTC derivatives positions in recent years. The overall volume of compressions increased strongly in 2014 but continued to grow in the first half of 2015 (Graph B, centre panel). The decline in outstanding OTC derivatives contracts largely stems from a sharp contraction in notional amounts in the euro-denominated interest rate segment. The notional value of such contracts fell from $167 trillion to $126 trillion between end-December 2014 and end-June 2015 (or equivalently from €138 trillion to €113 trillion). Since late 2013, the outstanding volume of EUR interest rate swap notionals has dropped by about 50% (Graph B, right-hand panel), thanks to a strong increase in compression. Basic compression technology has been available for several years, but has gained particular traction in the interest rate swap (IRS) segment in the past two years (Graph B, centre panel). Growing demand by global bank dealers for more efficient balance sheet usage (partly driven by regulatory changes) has been a key catalyst for technological innovation that facilitates the compression of derivatives trades. The most popular compression services are offered by third-party providers, drawing on submissions of the portfolio positions of each of their subscribers. An algorithm seeks to identify redundant contracts that can be terminated without changing each participant's net position. 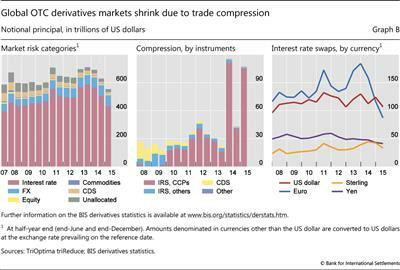 The shrinkage of a dealer's derivatives book via compression techniques helps reduce operational risks, counterparty risks and associated costs. Compression had already contributed to a significant decline in outstanding notional amounts of credit default swap contracts in the years following the Great Financial Crisis. More recently, the pickup in clearing of IRS through CCPs (see Domanski et al, "Central clearing: trends and current issues", in this issue) may have led to an acceleration of this trend, since central clearing has further enabled the use of sophisticated compression techniques. 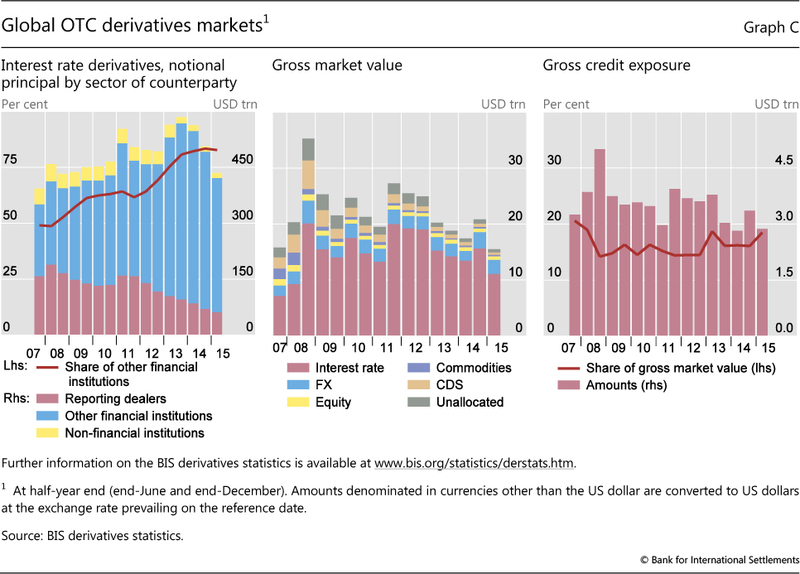 The distribution of interest rate derivatives by counterparty points to a continued shift in activity towards financial institutions other than dealers, including CCPs (Graph C, left-hand panel). Contracts between dealers and other financial institutions, including CCPs, stood at $360 trillion at end-June 2015, down from $421 trillion at end-December 2014. More recently, compression methods have emerged that do not require third-party involvement. This has led to a further pickup in compression volumes. And some newly available electronic trading platforms for OTC derivatives - such as swap execution facilities (SEFs) - have also started to offer efficient mechanisms for cancelling offsetting positions between counterparties. The gross market value of outstanding contracts - that is, the cost of replacing all outstanding contracts at market prices prevailing on the reporting date - also decreased in the first half of 2015 (Graph C, centre panel). Gross market values have continued their downward trend of recent years despite a brief spurt in late 2014. Market values stood at $15.5 trillion at end-June 2015, their lowest level since 2007. Along with compression, a narrowing gap between rates on the reporting date and rates at contract inception may have contributed to the decline. Gross credit exposures, which take into account the reduction of counterparty credit risk through netting agreements but not collateral, also declined, to $2.9 trillion at end-June 2015, close to pre-crisis levels (Graph C, right-hand panel). Over this period, currency movements overstated the contraction of positions in non-US dollar currencies. For example, the euro's depreciation against the dollar between end-December 2014 and end-June 2015 led to a decline in the dollar value of euro-denominated positions. Yet, even after adjusting for this effect, notionals at end-June 2015 were still about 10% lower than at end-December 2014. There is a variety of reasons why the impact of compression has been strongest in the EUR IRS segment. EUR derivatives books tend to be very large from the outset, compared to those in other currencies. EUR IRS also tend to be more standardised and the set of broker-dealers active in these markets is less diverse. All this means that the scope for compression may have been larger in EUR IRS.